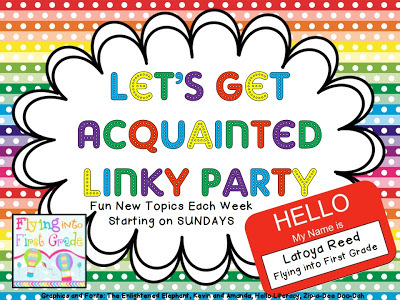 I decided to link up with this fabulous linky party! Flying into First Grade is hosting her very first linky party and it's all about getting aquainted. So, I am to share 3 things about myself that I like or do using only my initials. My initials are VLC! So here we go.. I played the violin when I was in elementary and middle school. I gave it up right before I went to high school because I thought I'd be "too busy" to devote time towards practicing...BIG MISTAKE. I'm a sap. I love love. I love all kinds of love. I love it when people love what they do...or show love, compassion, passion. Those moments make me choke up. They overwhelm me. I love my future hubby, my family, my friends, my job, my coworkers! I love love love love crafts! I love creating. It's like I go to another place. I get so happy when my product is finished and completed. I love sharing my work with others! OOOOH crafts. My love for crafts is the reason why I am slightly stressed about the wedding...I've decided I can make most of the invites, thank you cards, save the dates, and decorations...I'm sure I'll love every moment! Check back soon...I'm going to have more details about the Sale Extravaganza up soon...you don't want to miss out!